As I write my latest update of progress on the road of professional golf, I’m sitting at home in Naples, Florida – surrounded by chaos. Downed trees, collapsed power lines, heavy flooding and many homes destroyed is what’s on view here. Luckily our home didn’t sustain any major damage or flooding and we are just having to make do without power for a while. The job of dealing with the evacuation and now the clean up has provided me with enough distraction from the major disappointment of having to withdraw from the Web.Com Q School due to injury. Not to dwell on the negatives, August was another successful month on the golf course for me. 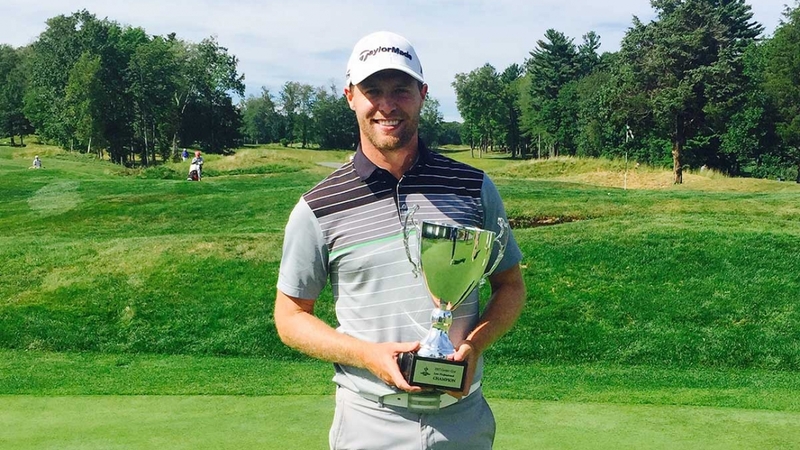 I played in two events, the Providence Open in Rhode Island and the Gately Cup in Connecticut. Scores of 70 73 in Providence left me in a tie for 20th place. I played lot of good golf at that event but a cold putter hurt me. I decided it was time to change back to my old Scotty Cameron putter before the Gately Cup and it went on to help me to achieve a major milestone! YES!! A win! My first victory as a professional. Rounds of 68 68 were good enough to get me into a playoff which I won on the third playoff hole. I checked the leaderboard approaching the final four holes and I knew if I could find some birdies on my way in I may have an outside chance. I holed a 6 footer for birdie on 17 and on 18 I drained a 35ft birdie putt. I must say, I was a little surprised somebody in the field didn’t pull away but I was delighted to have a real opportunity to win. In the playoff I was steady and on the third playoff hole I hit a great wedge from 118y into a tight pin to about 6ft. My opponent short sided himself and that was effectively that. That was a big stepping stone for me. I’ve been knocking on the door all season and to get it done in one of the final events of the year was very satisfying. To experience the pressure of a playoff and to be in control of my game and play good golf is evidence I’m on the correct path. Golf is full of ups and downs and to dwell on the disappointment of my poorly timed injury at Q School would be foolish of me. I must focus on the hugely successful season I’ve had and use it as spring board to be even better moving forward. In 2017, to date, I have played 11 events. I’ve had three Top 20s, one Top 10, five Top 5s and collected my first professional win. My stroke average for the year is my all time lowest at 70.1. This is what I will choose to focus on. What’s even more exciting, is that I know I have plenty more in the tank.